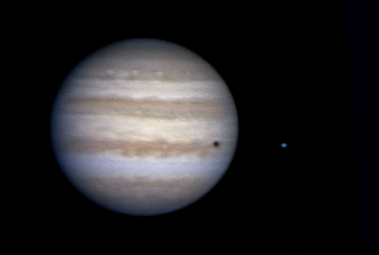 observing and imaging Jupiter has been tough over the last years for us northern folks. 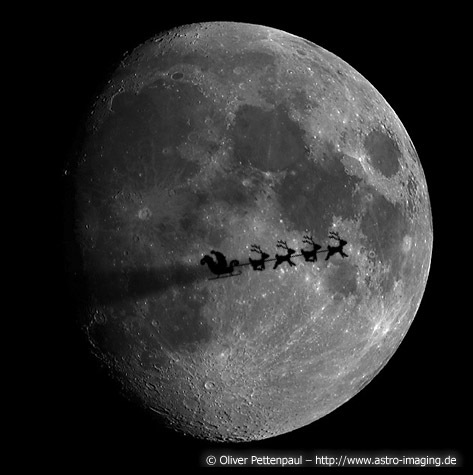 The low declination caused low transit altitudes – difficult conditions for fans of the big one. Fortunately – at least for inhabitants of the northern hemisphere of earth – conditions already improve this year with max. 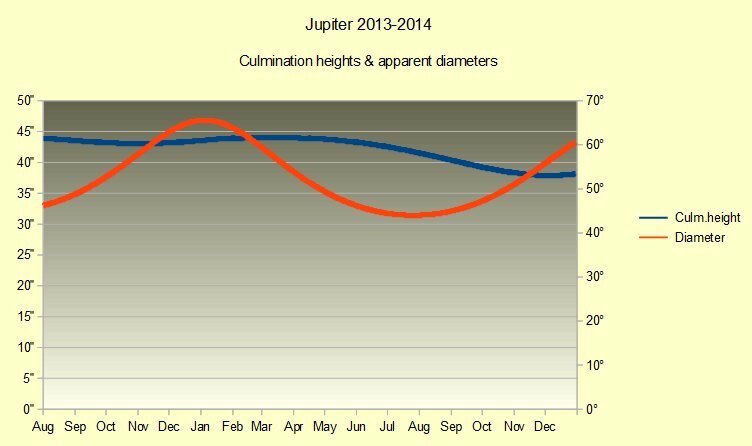 transits of around 38° altitude during the summer months and the outlook is great. The quick messenger of the gods is a hard nut to crack due to it’s small apparent diameter and close elongation to the sun but there are a number of days around the maximum elongation periods that offer best conditions to image mercury in daylight. I never imaged mercury before and am curious if I’ll be able to capture some surface details. Mercury is very fast on it’s orbit around the sun but rotates very slow around it’s own axis. It’s possible to capture thousands of frames within several hours and select the best of them for stacking. Using an IR-pass filter or red filter helps to increase contrast during daylight and tame the seeing. Saturn opposition 2010 is coming soon. I hope that weather is getting much much better than it has been over the last months. The currently beginning solar activity cycle should provide interesting targets to image the sun in white-light, CaK and H-alpha. I should finish the upgrade of my PST to a larger aperture. A first working test version has to be in place soon. Constant development will follow. I recently visited the Gasometer in Oberhausen currently hosting the exhibition Out of this World – Wonders of the Solar System. The Gasometer is a decommissioned circular gas holder building once featuring a giant disc floating on the contained gas. 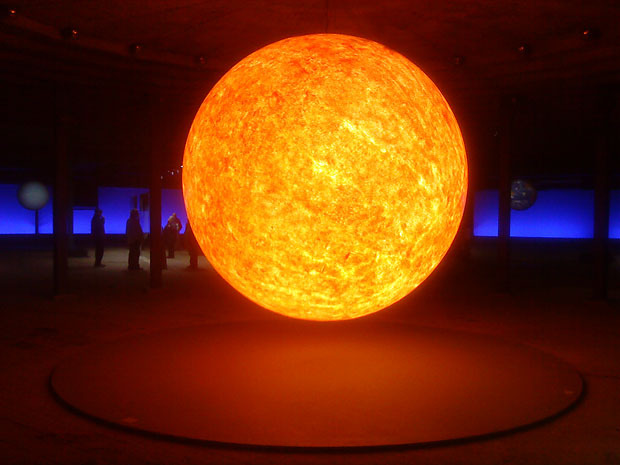 Main focus of the exhibition is our solar system that is illustrated by large models of the sun and planets and various photographs and images displayed at an impressive scale. One of the exhibitions highlights is the biggest moon on earth, a breathtaking 25m diameter model of our earth’s moon floating in the upper 100m high space of the Gasometer. Besides the solar system the exhibition focuses on various aspects of the cosmos, space missions and mankind exploring, observing and explaining the universe in different eras. The exhibition provides a fascinating and enjoyable experience even for astronomical-interested being familiar with the displayed matter. Besides the exhibition the Gasometer location itself is worth a visit. 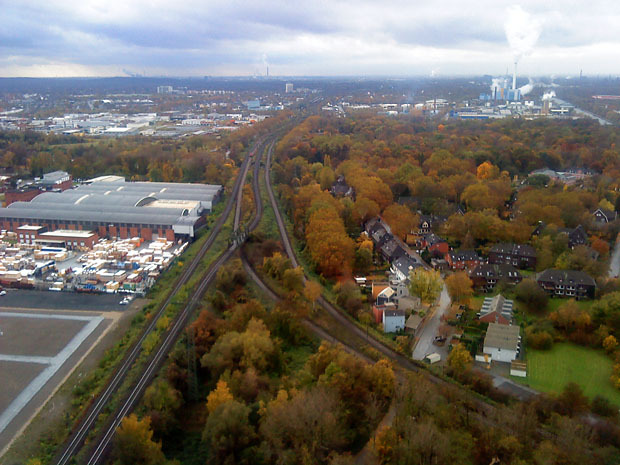 An elevator takes the visitor without fear of heights up to the top of the building measuring 117m offering a fine view over the Ruhr scenery. 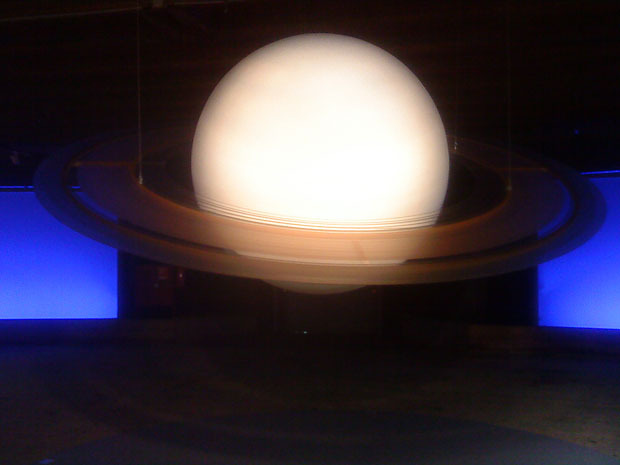 Out of this World – Wonders of the Solar System is on display from April 2nd 2009 to December 30th 2010 and I can only recommend a visit. Bring some warm clothing during winter months with you since the building can not reasonably be heated and visiting the roof can be quite frosty.